Participants will be Listed at the Bottom of this Page! What is "Shells for NJ Shores"? 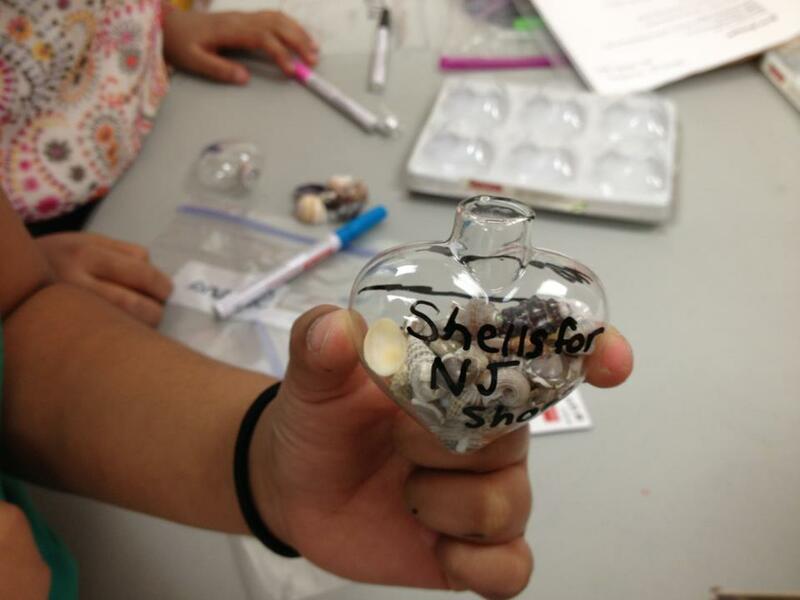 "Shells for NJ Shores" is an art project for teachers, students and artists everywhere! You are all invited to create small "seashell themed" works of art and sell them to raise money for those who need assistance recovering and rebuilding in New Jersey. After you make your donation, fill out and submit the form on the "Track Our Collaborative Donations" page so we can see how our collaborative donations and our students' heArt-work are helping others. Hurricane Sandy left many people in New Jersey shore towns in total devastation, losing their homes and everything they owned. We can help by participating in this project. Create or choose a shell themed art project to make and sell. Please feel free to interpret this project as you wish. If you want to join our group board to pin your shell-themed art ideas, send me an email with the link to your Pinterest profile and I'll send you an invite. After you finish making your "Shells for NJ Shores" artwork, set a price you think would be appropriate (Suggested price would be in the $3.00- $5.00 range). Sell the artwork where you feel is appropriate. Consider giving a certain number of shells to people who are willing to sell them. Collect the money and then give more to people who know they will be able to sell them. Connect with your P.T.O. and other parent volunteers who may be able to sell the shells at events, local functions or groups, work, friends, etc. Another option is to invite students to set up a table with you or their parents in front of a local (and willing) business either after school or for an hour or two over the weekend. It is important that any money raised be sent to reputable organizations that will benefit the recovery and rebuilding efforts of the families and individuals devastated by Hurricane Sandy. Please click on the "How To Donate" tab at the top of the page to view suggested organizations. These are only suggestions. Make your own choices as who to donate to. After you send your donation, please fill out the form by clicking the "Track Our Collaborative Donations" tab. I will tally the amount we raise together and will update our total monies donated on this page. Your school will be added to the list of participating schools on this page so we will all know who we have partnered up with to make a difference. "Shells for NJ Shores" was created by Art Teacher, Suzanne Tiedemann and the students of Brunswick Acres Elementary School in South Brunswick New Jersey. The idea was inspired by the "Haiti Houses" project created by Ann Ayers and Ellen McMillan. We are hoping that others will join forces with us, get creative and raise money to help our friends on the Jersey Shore recover and rebuild.